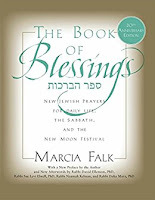 Last week, I received an email from a publicist inquiring if I would like a review copy of the new and updated edition of the The Book of Blessings by Marcia Falk. I jumped at the chance to acquire a copy of a book that has long been on my wish list. As if in synch with #BlogElul, the book – full of poems, blessings, and prayers – arrived today, when the daily prompt is “pray.” How fitting. It is late and I am tired, but even a quick perusal of the book’s pages tells me it overflows with spiritual beauty and sustenance. Its words, carefully strung together, form an intricate lattice that helps us reach our souls, our hearts, our God.